KHAPLU TOWN: Khaplu is a head quarter of Ghanche, another district of Baltistan. This district comprises over three subdivisions and population ranks 85,000 by annual growth rate of 2.5 percent (Cences-1998). Geographically it has strategic importance, as it shares borders with NubraLadakh, while Siachen glacier stretches from 100 Kilometer. There are number of mighty mountains such as Masharbrum( 7861m) stands proudly by challenging the trekkers and mountaineers to scale their magnitude. Khaplu town, now a municipal area is consisting of 10 public representative blocks (Municipal wards) and all governmental machinery of the district exercises from here. Households as by1998 censes are 1800 and has 7.5 family sizes approximately. Culturally this town has significant value because it was the principal seat of Yabgo dynasty and here number of old Khanqas, historical settlements and Khaplu palace still depict the past. Khaplu palace originally known as the YabgoKhar correlated with the name of ruling family of Khaplu now the second district of Baltistan. Before possession of this area by Dogra,s of Jammu on 1840, an indigenous family was ruled the Khaplu by linking their lineage to Yabgo’s of Chinese Turkistan. 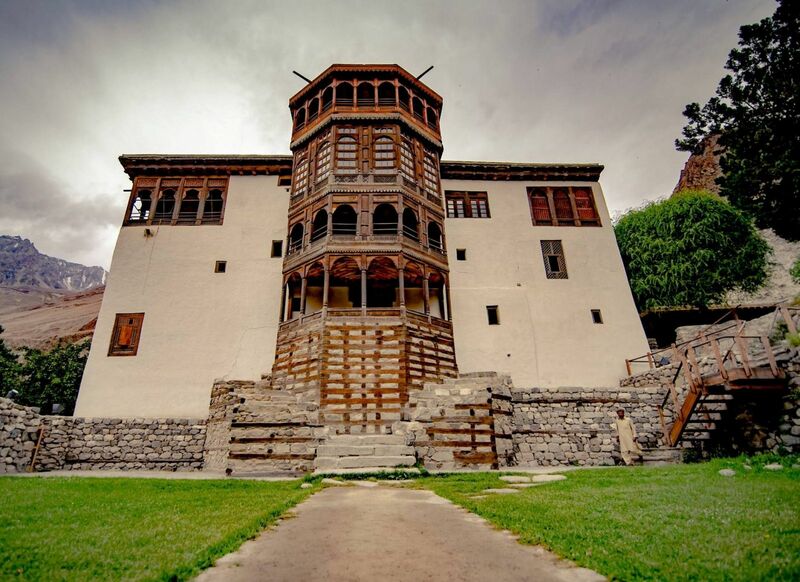 Dogra’s dislodge the royal family from a castle originally was rests on a high cliff named Thorsikhar on west side of Sheyok River and force to erect a new palace know we known as khaplu palace for yabgo’s residence by using maximum material of old one. Kharin Balti an offshoot Tibetan language stands for palace and yabgokhar means palace of yabgo’s and still on the tongues of people. When the political reforms introduces in 1972 period the then political leadership, Zulfiqar Ali Bhutto had flattened the Rajgi system throughout the Gilgit-Baltistan and as result Yabgo dynasty lose its administrative power as others and hang on to symbolically . Khaplu Palace was the residential space and was used till1995, after that the royal family shifted themselves on new constructed houses adjacent of the palace and deserted the khar. With course of time and due to weathering the palace was under severe deteriorating condition alongside with other built heritage in the area.Baltistan known as little Tibet in olden days has rich architectural and cultural heritage. The Yabgo’s of Khaplu, Amacha’s of Shigar and Maqpoon’s of Skardu had built superb forts and palaces during their reign. After Islam in 14th century many wooden mosques and Khanqa,s were built all around by the saints and their disciples , who came Baltistan from Kashmir. In all these said buildings local materials were used and wood carvings and architectural feature still astound the looker-on. But with passage of time such type of immense built heritage assets were being prey of weather and ignorance. In the meantime, Aga Khan Cultural Service, Pakistan (AKCSP) came forward as an agency to safeguard the prominent built heritage with collaboration of local community with clear mandate. In 1998 AKCSP started pilot’s projects in Baltistan, alongside this AKCSP technical team documented each and every one built heritage of Baltistan and compiled a value able data which can be use for any future planning from government or NGOs sides to preserve the documented sites lying unnoticed. According to a technical team survey of listing of heritage monuments of the region the government agencies and NGOs are not influencing on protection of cultural heritages. So therefore, considering the facts and ground realities AKCSP established an appropriate mechanism to empower local communities to ensure protection of existing cultural heritages. 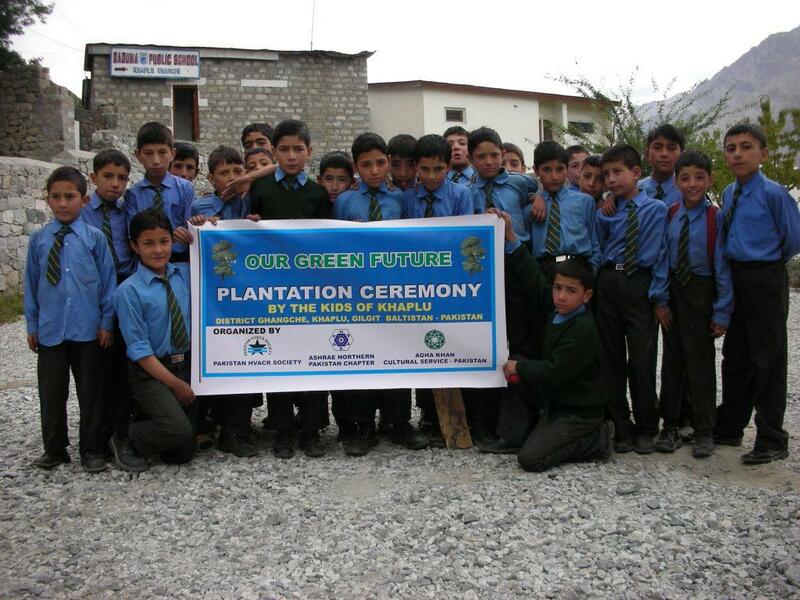 Before to go further on or any physical intervention, AKCSP initially established Baltistan Culture Foundation (BCF) later renamed BCDF as an umbrella while Town Management Societies of Khaplu and Shigar as local chapters of BCDF. The former is registered on companies ordinance act while the TMSs are answerable to society act 1866. These are the representative organizations with public trust and the main idea behind their formation is to include the community in the restoration and land use planning for their respective areas by regarding built environment. At Khaplu, AKCSP physically upgraded two historic settlements by providing washing spaces, community bath rooms, street pavements, tape water and historic houses improved. Following that Astana Mir Muhammad (300 years old) was also restored in original state and has won UNESCO Distinction Award-2005. 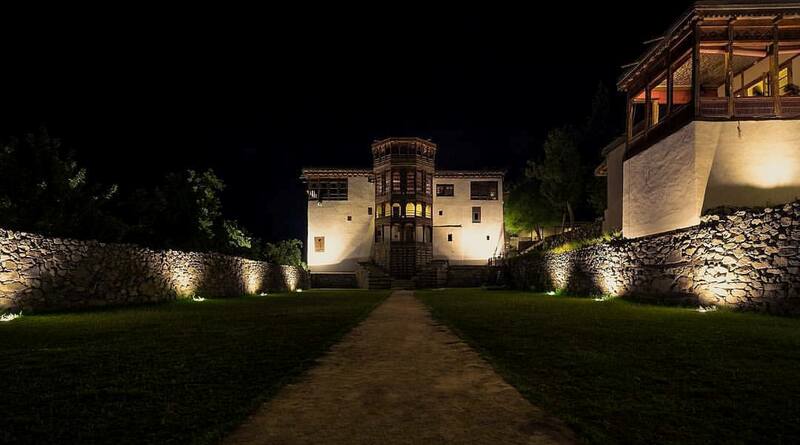 Khaplu Palace restoration and re-use is the one of biggest community-based project done by AKCSP in Gilgit-Baltistan since 1998. Like the other projects completed by AKCSP, this complex will be open for the people of all folk of life. Guided tours for group will be arranged for the museum while the people who will be staying in the guestrooms have an advantage of experience the whole site. AKCSP has a strong hope of making a kind of linkages between the other completed restoration projects in the region. Exchange of visitors from Baltit Fort (completed in 1996) in Hunza and Shigar Fort Residence (completed in 2005) in Shigar will give them an opportunity to have an exposure of cultural heritage in the region. The oldest building in the complex, the Palace was built by the royal family in 1840 and used as a seat of governance, grain store and royal residence. Given its significance, the Palace should be treated as if it were a Grade 1 listed building. The highest conservation standards are applied in both reuse design and construction. The key principles that underpin all good conservation are ‘minimum intervention’, ‘reversibility’ and ‘knowledge, experience and skill’. What this means in practice is that any intervention should have a minimal disturbance to the original fabric; as far as practical, historic materials were left undisturbed and in situ. The introduction of new materials, such as hard floor and wall finishes, were kept to the absolute minimum. Where possible, new interventions, modifications or alterations done reversible with a minimum of damage; no alteration to internal walls or openings done with great care taken over introduction of services and new partition walls.The quality of professional advice, decision-making and direction of the work that is obtained of a highest standard, both during the construction period and after. An inscription over the main doorway dates construction of the house to 1905. Although not comparable in terms of its significance and architectural quality to the main Palace building, Darbar House is none the less an important part of the historic ensemble and conservation standards should apply. It is treated as a grade 2 listedbuilding. This means that no alterations or additions to the main structure or external walls will normally be allowed. Internal changes is permitted, but should be limited to those necessary to improve living and working spaces and executed with regard to the historical and architectural features of the building. ChamanTzar House the stable and Ra Tzar House were constructed between 15 and 25 years ago and are the newest part of the complex. Although recently built intrinsic architectural value, the houses form part of the historic complex and play a specific typological role in framing the entrance way. In this respect, whilst the fabric is treated with conservation standards the formal arrangement of the units and their specific relationship to the entrance, ceremonial garden and palace must be closely considered. There are two formally organized garden spaces adjacent to the palace. The ChaoniTzar, which forms a key part Char Bagh Persian garden, with geometrical area separated by water courses. In more recent times it was used as a ceremonial gathering space beneath the Palace where the Raja could preside over celebrations and hold court. 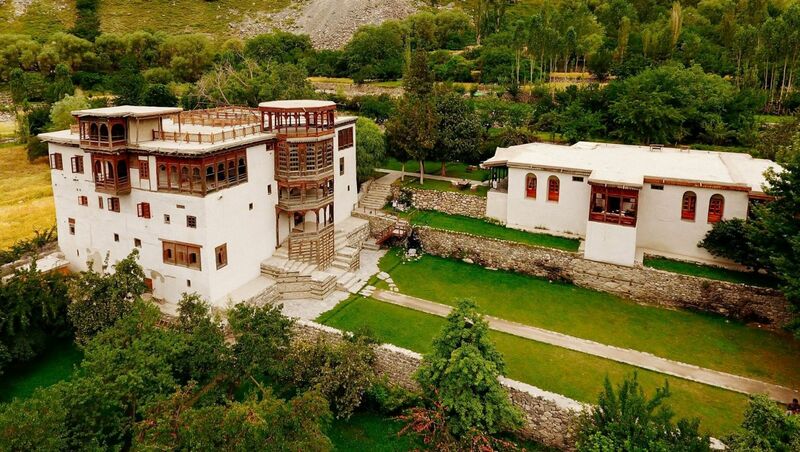 Khaplu Palace originally known as the Yabgo Khar which means " Yabgo's Place" correlated with the name of ruling family of Khaplu now the second district of Baltistan, was built in 1840. Till 1995 palace was the residential place of the royal family, after that the royal family shifted themselves on new constructed houses adjacent of the palace and deserted the "khar". With the passage of time such immense built heritage assets were under severe deteriorating condition alongside with other built heritage in the area were being prey of weather and ignorance. Aga Khan Cultural Service, Pakistan (AKCSP) came forward as an agency to safeguard and conserve this prominent heritage and to restore from a dire state of dilapidation. In 2005 AKCSP started the renovation of heritage. Mr. Fahim I Siddiqui and Mr. Waqas Jafri from FND was charged with the design and integration of modern heating, ventilation and plumbing systems which was a challenge for all the conservation projects. In April 2010 mechanical construction contract was then awarded to M/S EEC under the supervision of Mr Ather Naseem Siddiqui. Khaplu being located at a height of 8500 feet and access was only a rugged terrain, purchasing & transporting the material from outskirts was a mammoth task while the labor was another issue. Despite of all the difficulties, rugged terrain, inclement weather and the height of the site, this difficult task was accomplished and handed over on July 2011 with an effective working period of 15 weeks. Central heating system was installed based on hot water produced by diesel operated boilers circulated to fan coil units for space conditionings. The system comprises of 3 water heaters each of capacity 150 kW, 3 calorifiers each of capacity 375 USG and around 30 fan coil units of various capacities with majority of copper piping was carried out. After renovation, this complex was converted into a five-star hotel “Serena Khaplu”. Because of its historical importance, this has now become a tourist attraction. Darbar House, Ancillary houses & Stable at Entrance were also renovated. A modern state of the art kitchen and cold stores were also designed & installed for the hotel's restaurant. The project design and construction was such a state of the art In 2013 that the palace was awarded the "Award for Distinction" by UNESCO Asia Pacific Heritage Awards, thus its an honor for the designer, construction contractor and all the other related staff. And EEC feels proud to be part of it.